Combine sausage, green onions, garlic, mustard, salt, and pepper. Peel the cooled eggs and roll in flour. Press out the sausage mixture into patties and wrap around the floured eggs. whisk the remaining 2 eggs together to form an egg wash. 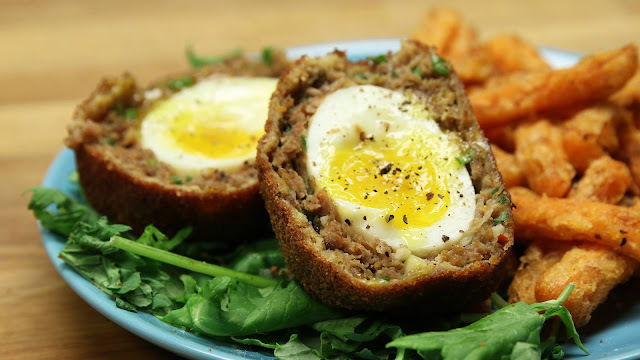 Roll your sausage-wrapped egg in flour, then egg wash, and finish in the seasoned bread crumbs. Repeat for each egg. Heat oil to 300˚F and fry each egg for about 3 minutes, until browned on all sides. Transfer fried eggs to a baking tray and finish cooking in a preheated oven for 5 minutes at 200˚C/400˚F.